Underwriters Laboratories, Inc., a globally-known source for product compliance. In addition to maintaining overall knowledge and experience with the ASME A17.1/CSA B44 Safety Code for Elevators and Escalators, ANSI requires that the individual AECOs be well-versed in the PBC, which provides an efficient, standardized method for establishing safety requirements for new elevator technologies. 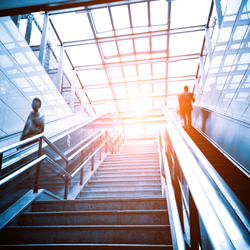 The PBC is considered an important complement to the 2007 version of the Safety Code for Elevators and Escalators - ASME A17.1/CSA B44 - which serves as the basis for the design, construction, installation, operation, testing, inspection, maintenance, alteration, and repair of elevators and escalators in the U.S. and Canada. In order to certify an innovative product, the PBC requires that applicable Global Essential Safety Requirements (GESRs) be selected from a list in this Code. A comprehensive Risk Assessment is then carried out by the applicant to ensure that the applicable GESRs have been met. The applicant is required to produce a Code Compliance Document (CCD) that includes the risk assessment; design and testing information; and various procedures necessary for the safe operation, inspection and maintenance of the elevator over its life cycle. The role of the AECO is to review the CCD and to verify that the PBC requirements have been met. The AECO reviews the applicable GESRs to ensure that the process has been appropriately executed, the risk identification and mitigation process is complete, safety parameters have been applied as needed, and residual risks have been addressed. Upon completion of the PBC compliance review, and after careful scrutiny of the CCD, the AECO would issue a Certificate of Conformance, confirming the equipment complies with the PBC. The AECO would then audit the process to verify that the certified equipment is being manufactured and installed to the requirements defined in the CCD. To ensure a peak level of AECO competence, accreditation according to ISO/IEC Guide 65 is required. Accreditation is provided by ANSI or the Standards Council of Canada (SCC), the highest authorities in each country for national standards. Due to the superior standards set for the AECOs, this accreditation is held in high esteem by industry officials. "AECOs are of vital importance to the industry as we continue to pursue adoption by local jurisdictions of the PBC as part of the latest Safety Code for Elevators and Escalators and for ensuring the safe and proper production of new equipment and technologies," said Edward Donoghue, Managing Director of NEII. "Our mission has always been to encourage safe building transportation, and SCC's and ANSI's AECO program is an invaluable way to ensure proper processes are in effect for guaranteeing this safety." Applicants must meet several requirements to apply for AECO accreditation, including: proof of ownership of a certification mark and/or certificate of conformity, proof of the publicly available documents describing the applicant's program, and a written description of the program, including a list of the standard(s) utilized and the identity of the inspection and laboratory body. Currently, the AECO applicants are still being reviewed and accreditation from ANSI may take up to another six months to complete the assessment process. The National Elevator Industry, Inc., is a national trade association representing the interests of corporations, firms or companies that, as part of their regular business, provide or perform any of the following: manufacture (including parts or components used by others in the manufacture, repair or maintenance), install, repair and maintain elevators, escalators, moving walks and related equipment. Trust membership is available to those corporations, firms, or companies who, as part of their regular business, employ members of the International Union of Elevator Constructors (IUEC) and contribute to the benefit trusts (Trusts) established by agreements between the IUEC and NEII. NEII strives to become the leader in promoting safe building transportation, as well as working with local government agencies to encourage the adoption and enforcement of the latest codes and standards. For more information about NEII or the PBC, log on to www.neii.org or www.pbc-elevators.com.